Not being a golfer, visiting the Old Course at St Andrews was never going to give me a bad case of butterflies in the stomach. On the other hand a huge orange sun climbing out of the sea, lighting up the perfectly kept greens, and casting long shadows over the higgledy-piggledy fairways as they waited for the first of many golf balls to be driven across them did leave me in awe of the place. It got me out of bed in the Old Course Hotel to gaze at it from my window. It was an unmistakeable view. I could see Swilken, the little stone bridge that has carried every great golfer in the world over the wee burn up towards the 18th hole. And in the distance, with its own spectacular views of the course, the Royal and Ancient clubhouse, the home of golf, where 400 years ago men were hitting balls made of feathers wrapped in leather across these lumpy links and laying bets as to who would win. Over an early breakfast of delicious comb honey and yoghurt a couple of Texan guys were extolling the delights of the Old Course. "We can't believe this place," they told a pretty waitress who brought them a huge Scottish breakfast of bacon, eggs and fried haggis. "It's the best place in the world and we don't wanna leave." I had checked in for one night on my way further north to fish for salmon. Not having been there for twenty years I had come with vague memories of the interview I had done all that time ago with the Head Greenkeeper on the Old Course for a series of BBC Radio programmes I was making called In Keeping With Tradition. The brief was to interview people with the word "keeper" in their job title, so someone who had to take care of the most amazing golf course in the world would certainly have a story to tell. 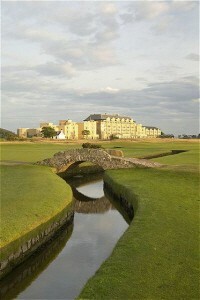 The Old Course Hotel sits on the hallowed 17th Road Hole and is one of the Leading Hotels of the World. You can watch the golfers as they play past you and hear their curses or cheers as they whack the ball along the fairway. Be careful though. You are so close to the game that a stray ball can easily whistle past your ear. Such idyllic surroundings made me want to take up the game there and then, but instead I headed for a swim and a little therapy in the Khola Waters Spa, which was opened in 2006. It has eleven treatment rooms, a thermal suite with a hydrotherapy pool, plunge pool, Japanese salt steam room, sauna, fitness suite, exercise studio steam rooms, nail studio and a roof top hot tub. 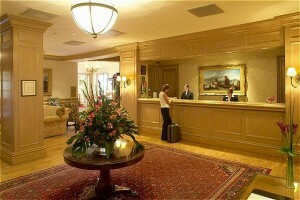 It's quite a showpiece for the Kholer Company which now owns the hotel. I passed on the facials, exfoliating, manicures and pedicures but did enjoy some reflexology and a shoulder massage, having first swum a few lengths up and down the pool. Luckily the Tommy Hilfiger golf and sports shop in the hotel came to my rescue because I had nothing to swim in and I ended up with a pretty little number in lime green which will come in handy for future swims! I met up with Kim Keble-White, the Sales and Marketing Director, in the Road Hole Bar overlooking, yes you've guessed it, the Road hole. It's up on the top floor and has spectacular views and reputedly carries nearly 200 malts from every distillery in Scotland. Over dinner in the Road Hole Grill, which reminded me of a ship’s dining room with large tables and plenty of space, I had the most delicious scallops followed by Aberdeen Angus fillet of beef. I was also tempted by the venison but left it for another time. 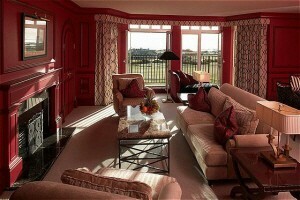 Kim was keen to tell me of the many golf courses around St Andrews, apart from the Old Course. One of them is the hotel's very own - the Duke's Course, set in the picturesque Craigtoun Park two miles inland from the hotel. It's a beautiful course, dotted with yellow broom and has panoramic views over the old town of St Andrews. With a five star clubhouse, restaurant, bar, a fleet of golf buggies and a helicopter pad the only thing you can't do there is stay the night! I can't wait to try it out, perhaps with a pro to give me a few tips.